A dog meat vendor in Hunan province died after accidentallly shooting himself with a poisoned dart fired from a crossbow that he used to kill dogs, mainland media reported. The man was reportedly demonstrating how to use the toxic dart to other members of his meat-selling operation in June, when the crossbow went off and hit him in the leg, and he died on his way to hospital, several mainland media outlets said. 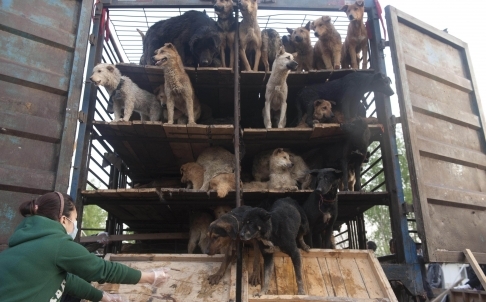 Five other members of the gang, who confessed to killing more than a 1,000 dogs as part of the operation, were later arrested. They said they froze the carcasses with the intention to later sell the meat. Some Chinese believe eating dog meat will dispel evil ghosts and ward off disease. It is widely believed the meat can boost a man’s sexual performance, and practitioners of traditional Chinese medicine say it can help treat impotence. The meat is popular in Hunan and in cities in Zhejiang , Guangxi and Guangdong provinces. But aficionados face pressure from China’s increasingly outspoken dog lovers and animal rights groups, who have been campaigning to end dog meat festivals.